The remotest state in the country – Mizo means highlander - that's how many term this lush green land shaped like a finger pointing towards its southern neighbour the country of Bangladesh . Bordered to the east by Myanmar and Assam stretching to its north it also shares borders with Manipur to the north east and Tripura to its north west . A mountainous state, Mizoram, sustains a wealth of flora and fauna blessed with abundant tropical forests and delightful panoramas of blue hills and thick bamboo groves. With almost the entire state being Christian, the people are a joyous lot who still uphold their ancient culture and traditions. It's lively capital Aizawl rises up on a tiered hillside populated with a surprisingly modern culture emulating the West in music and dance. 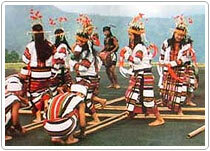 Mizoram even though being relatively remote has an 88% literacy rate the second highest in the country. Belief has it that the local people migrated from North west China less than 300 years ago. With a land area of 21,981 Sq.Kms, the average height of the lush green forested hills average 900 metres, while Aizawl stands on a tiered hill ridge at 4000 ft. Mizoram's cuisine is essentially created from pork and rice besides poultry. Excellent bakery's turn out 'meting in the mouth' breads, cakes and Pizzas, while a couple of restaurants serve dishes ranging from Chinese, Japanese and Korean to the fiery Tandoori. With a balmy climate the maximum temperatures rise to 30 ° C in summers and the minimum in winters drop to 11 ° C in winters. Rains like in all other north eastern states come with the south west monsoons and average around 254 cm annually. The best months to visit the beautiful laid back state are from October- May. Air : Indian Airlines operates regular flights to Aizawl from Kolkata and Guwahati. Rail : Silchar in Assam is the nearest rail station and is about 7 hours from Aizawl by road. Taxis and buses are easily available from here to Aizawl. Road : Aizawl is well connected with all the capitals of the north eastern states by a good network of roads. Regular buses are available from all the state capitals in the region , Aizawl can be approached through Silchar in Assam . Silchar is at a distance of 140 kms from Aizawl. Aizawl is connected to the rest of the country via Silchar by National Highway 44. Buses are available to Aizawl from Guwahati and other capitals of north eastern states. If you're driving down take NH 40 to Shillong from Guwahati - and then turn off to NH 44 to Silchar and finally NH 54 into Aizawl.